Last night I watched the “The Post” starring Meryl Streep and Tom Hanks. The film is described as; “thrilling, based on a true story. 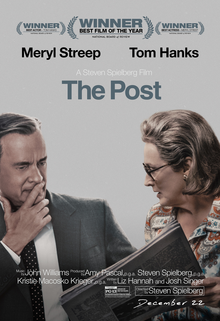 Determined to uphold the nation’s civil liberties, Katharine Graham (Streep), publisher of The Washington Post, and hard-nosed editor Ben Bradlee (Hanks) join forces to expose a decades-long cover-up. But the two must risk their careers –– and their freedom –– to bring truth to light in this powerful film (https://www.foxmovies.com/movies/the-post).” It was an interesting movie dealing with an historic and chaotic time in this nation that I am too young to remember. I did find myself cheering Streep’s and Hank’s characters on as they took a case of the freedom of the press all the way to the Supreme Court. I won’t spoil the ending but it was a good watch and worth anyone’s time who is interested in an event that would directly impact how the press covered the Watergate break-in (https://en.wikipedia.org/wiki/Watergate_scandal) and news moving forward to the present. What I’ve wrestled with since watching the movie is; “News exists in a vacuüm. The lives of the reporters, editors, and publishers are swayed by their political leanings, experiences, preferences, and worldviews.” We as the readers face the same limitation in our consumption of news. There are so many places to receive our news today that we can stay perpetually stuck in a bubble where only our viewpoints are legitimized. When this happens we cease being open to new ideas or our current ones being scrutinized and challenged. We become entombed, trapped by our own beliefs and limited knowledge. The truth isn’t important anymore only our belief of what is true.